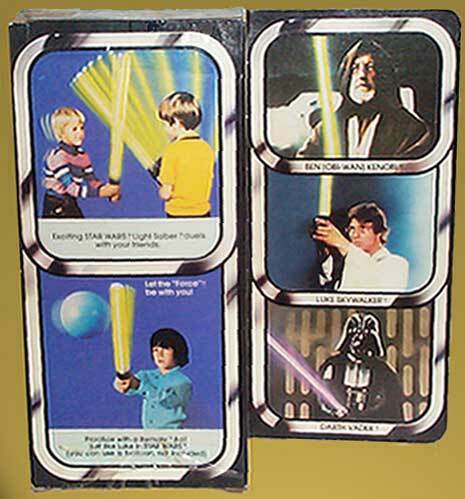 EXCITING PLAY ACTION WITH REPLICA OF LUKE SKYWALKER'S LIGHT SABER! The child-sized LIGHT SABER has a safe vinyl "blade." It's easy to inflate and lights up at the touch of a button in the handle. The LIGHT SABER comes with a special patch kit to insure its durability. . .two "D" batteries not included. Ah, the Star Wars inflatable light saber! Alhough it was the first licensed toy version of the Jedi Knight's weapon, it surely wasn't the best. This is because it basically consisted of a flashlight with a rubber tube attached to its lighted end. You could only wack your best friend with it one or two times before it ruptured and became...well, just a flashlight with a neat Star Wars sticker on it. Recognizing this flaw, Kenner even packaged the toy with a repair kit. And they actually advertised it as coming with this! How's that for inspiring consumer confidence in your products? 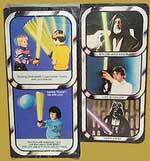 Thankfully, the inflatable saber wasn't on shelves for too long before it was replaced by the much better "The Force" Light Saber, which debuted in 1980 with the Empire Strikes Back toy line. 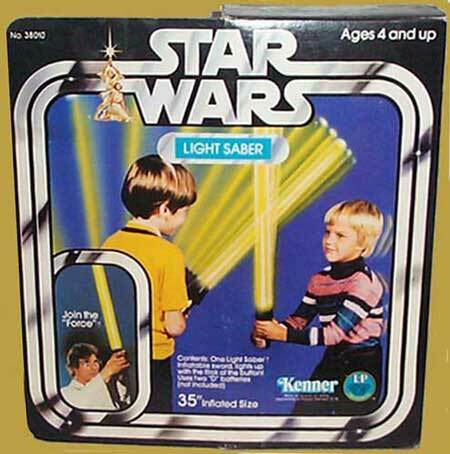 The inflatable saber was issued in one color only-- a yellow unlike any saber color seen in any Star Wars film. It can be found in two different boxes. The first version, which was available for a very short time, displayed a doctored image from the film showing Darth Vader and Obi Wan Kenobi locked in a duel. The second and much more common box pictured two children using the enclosed product.